After a night’s rest, it was time to return to foodie heaven (see part one here). To start off the day, it was time for a fruity smoothie! U-Juice have been open for just under a year at the Bullring indoor market and were providing a wide range of juices and smoothies (and even trays of wheatgrass!) to the thirsty people of day 2. The nice tartness of passionfruit balanced well with the sweetness of the mango and pineapple, and perked up our spirits. To help us moving even quicker, we had a quick taster session at Quarter Horse Coffee. Recently opened on Southside with a nice clean store, they provide coffee, beans and even coffee by subscription. We had a taste of the two choices on offer. A sharp Costa Rican brew and a more robust, sweeter Kenyan variety. We picked up a packet of Kenyan coffee to use in the Aeropress, for when Douwe Egberts finest instant isn’t enough. A quick side shuffle took us to Claudia’s Kitchen, who were promoting their new Mr Jamaican Jerk Pork Scratchings as well as jerk chicken kebabs, wings and wraps. A few samples were on offer for trial, it was a refreshing difference to the usual Black Country scratching, the jerk spice giving a flavourful kick with a spicy aftertaste. We enjoyed them immensely and picked up a pack for Wifey’s scratching mad brother! Back outside again to Streetfood Alley, a few new appearances from the previous day. Vegan Grindhouse were in attendance, who we had seen previously at Flying Teapot Markets at Sarehole Mill. And it was also a fond hello to the team from The Southern Oven (who were there both days). You may remember I previously had a po’boy and praline pecan brownies at Taste & Liquor with my friend Glen (which you can read about here). As Wifey didn’t have the chance to try the po’boy previously, I ordered up a shrimp po’boy for us to share (though that Jambalaya looked tempting!). Again, it was a portion of beautifully light fried shrimp, with the batter giving enough crispness to counter the soft bread. The remoulade tasted like a cross between salad cream and aioli and nice fresh lettuce. Wifey gave it two thumbs up. This time we attended a cooking game demonstration with the kitchen maestro, Chef Richard Turner of Michelin- starred Turners Restaurant in Harborne, again hosted by the lovely Vicky Osgood of Brumderland, and The Cookery Theatre Company. A few issues surrounding a carrier bag of missing ingredients meant a slightly delayed start but things were soon underway. With a few simple ingredients, a few not so simple ingredients, and a grouse, Richard set to work whilst answering questions about the history of Turner’s, using seasonal and local produce and gaining his Michelin star. The item you’re most unlikely to find in a supermarket is foraged pine oil. It was a stunning plate of food (unfortunately no samples), but a great example of how Birmingham is gaining its burgeoning mecca status of food. Post demonstration, our taste buds started to get demanding so we went in search of something sweet. It was Tama Crepes were at their first food event! What a way to join the scene! Ever in search of something new, we chose an apple crumble crepe. The manekineko (or should that be Crepekincko) logo was super cute too so I snapped a pic whilst the crepe was prepared. The crepe was, well, yummy with a beautiful oat crumble sweet stewed apples and cream wrapped in a light crepe. I’m glad we had one to share as it was huge. We even had a spoon to scoop out the delicious whipped cream. 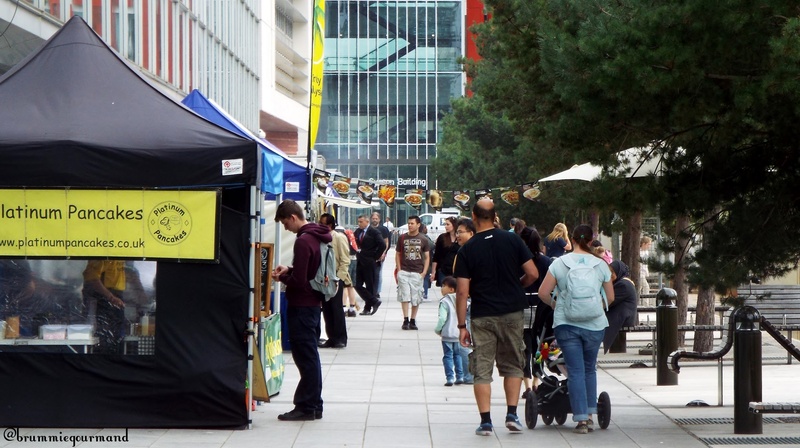 So that was it for Birmingham Independent Food Fair for 2015. It was that big, we didn’t cover even half the stuff going on and didn’t have time for all the workshops. Oh well, I’m sure we’ll be back next year to do it all again! (We weren’t done for food that day, however, you’ll have to wait to find what else we got up to! Until next time!